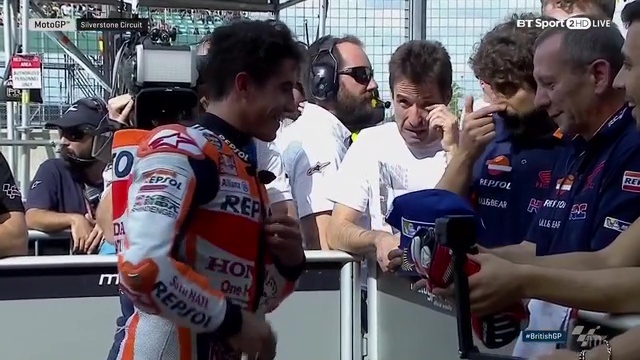 Marc Marquez (Repsol Honda Team) took a record-breaking pole and got down into the 1:59s for the first ever lap of SIlverstone under the two minute marker in qualifying for the British GP, but it was far from easy as the reigning Champion just beat Valentino Rossi (Movistar Yamaha MotoGP) to the top by less than a tenth and the two key rivals painted the timesheets red in the final minutes of the session. 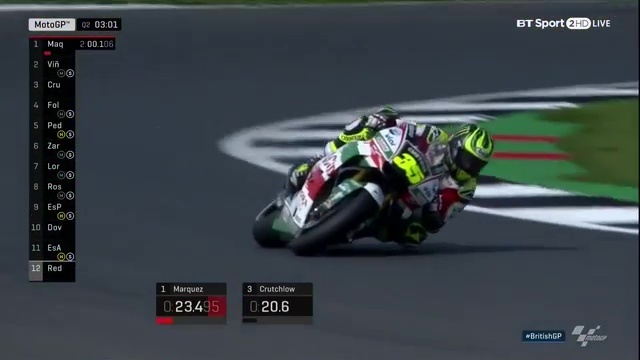 For incredibly close company in third there’s home hero Cal Crutchlow (LCR Honda) – fastest on Friday and on pole last year – with the whole front row covered by a tenth and a half. 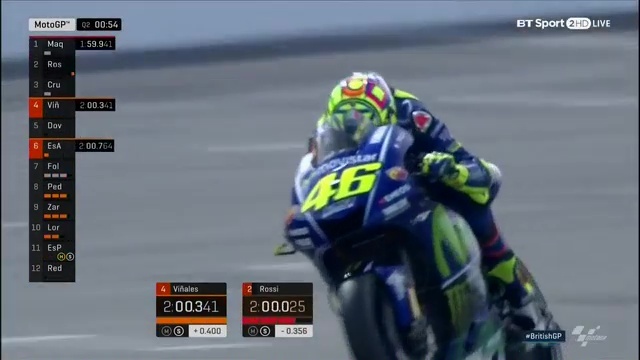 Maverick Viñales (Movistar Yamaha MotoGP) heads up the second row a further two tenths back on Crutchlow, just ahead of the fastest man in FP4, Jorge Lorenzo (Ducati Team). 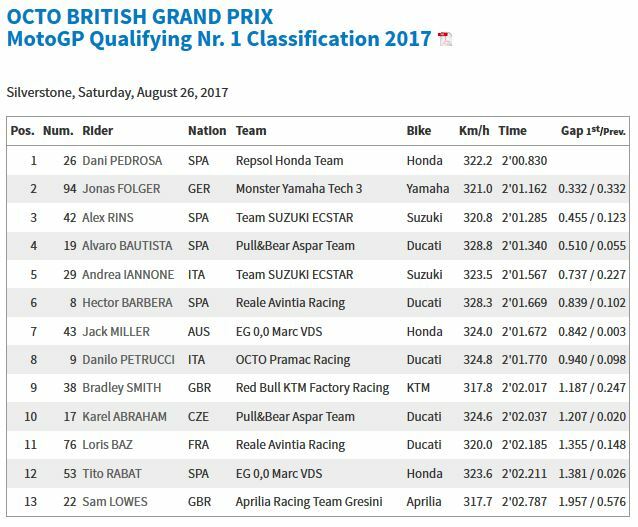 As on Friday, the number 99 was top Ducati at Silverstone in qualifying – just ahead of teammate Andrea Dovizioso in P6, 0.173 back. 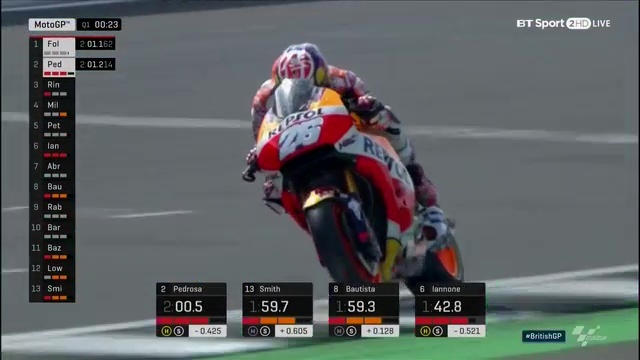 Dani Pedrosa (Repsol Honda Team) made the biggest leap forward on Saturday afternoon after a tough Friday and FP3, coming through Q1 to move up into seventh – and by only 0.006. 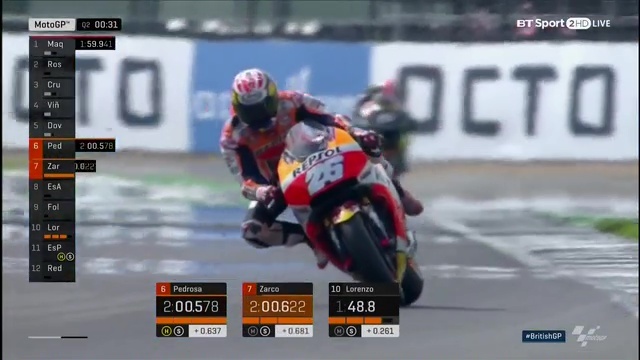 Just behind Pedrosa in the middle of the third row is Johann Zarco (Monster Yamaha Tech 3), with Aleix Espargaro (Aprilia Racing Team Gresini) completing Row 3 as he rides through the pain barrier. 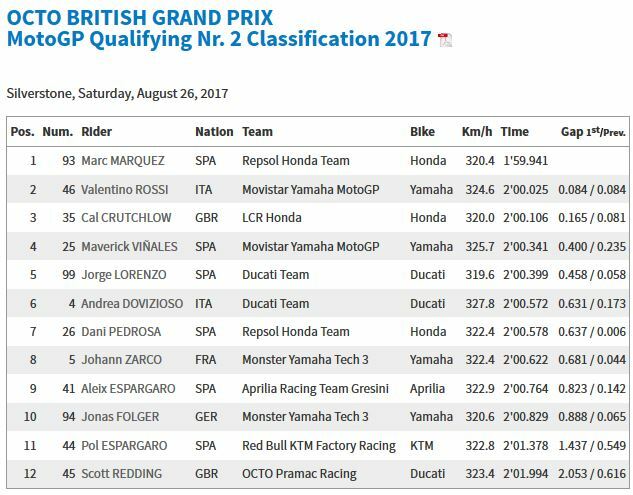 Jonas Folger (Monster Yamaha Tech 3), the second graduate from Q1, also managed to make some progress on Saturday afternoon and will start from tenth – just ahead of Red Bull KTM Factory Racing rider Pol Espargaro. 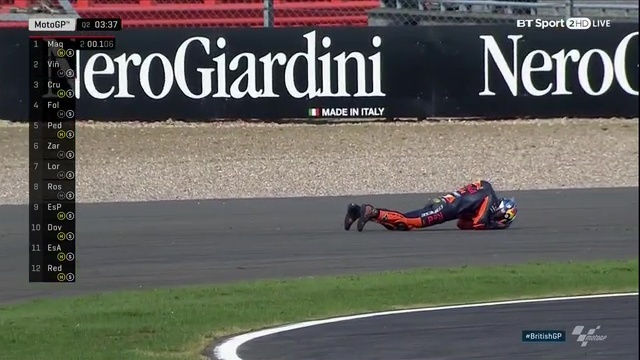 Through directly to Q2 after a stunning Friday, Espargaro suffered a crash in qualifying but nevertheless took eleventh for the British GP as KTM continue to impress. 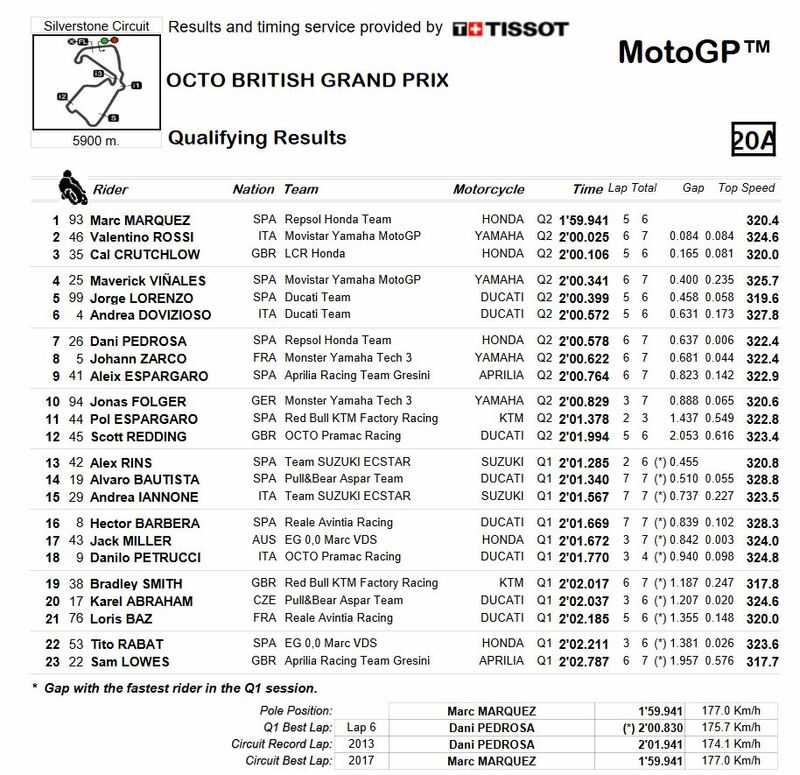 Scott Redding (Octo Pramac Racing) took P12 at a venue that has been a happy hunting ground for the Brit. 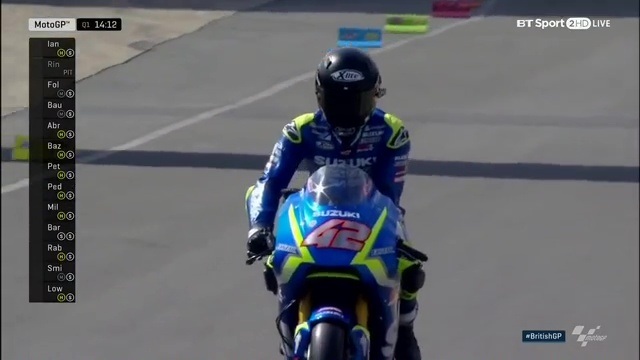 Thirteenth on the grid belongs to Alex Rins (Team Suzuki Ecstar) as the rookie shows some good pace at Silverstone, just ahead of Pull&Bear Aspar Team’s Alvaro Bautista, who begins his 250th race from P14. 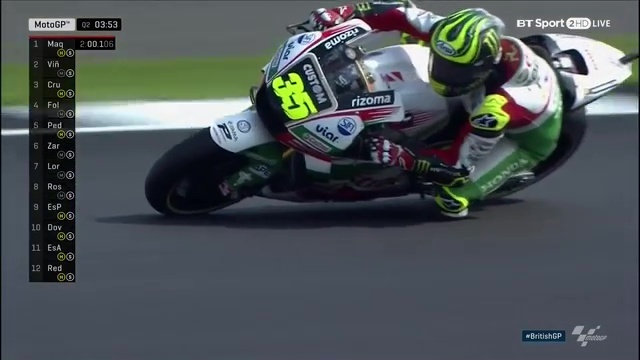 Andrea Iannone (Team Suzuki Ecstar) locked out the fastest fifteen. 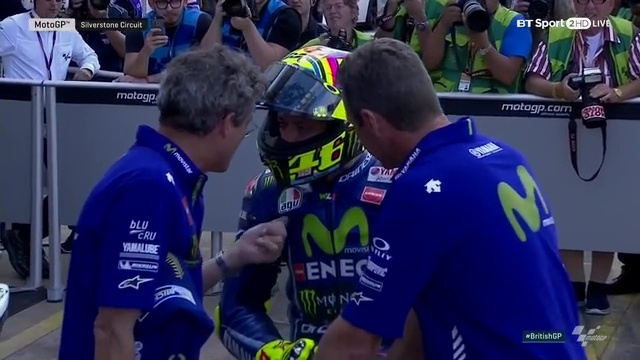 Valentino Rossi (Movistar Yamaha MotoGP) makes another bit of history on Sunday at Silverstone as he lines up to begin his 300th premier class race – becoming the first rider in history to hit that number. 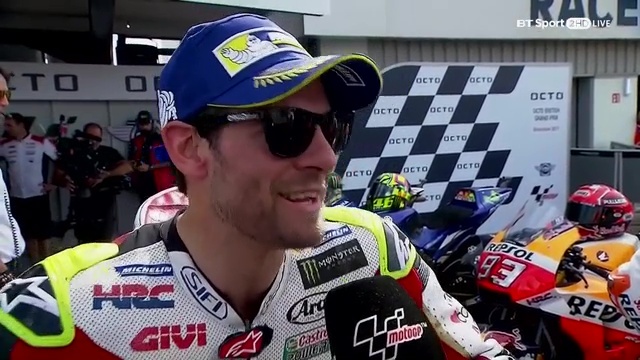 And he’s set up well for the occasion, just missing pole by less than a tenth and improving his best lap around the British track by some margin. There are some things to improve for tomorrow, however, with the rider from Tavullia hoping to fight for the podium – but tyre life the key thing to work on before the lights go out. 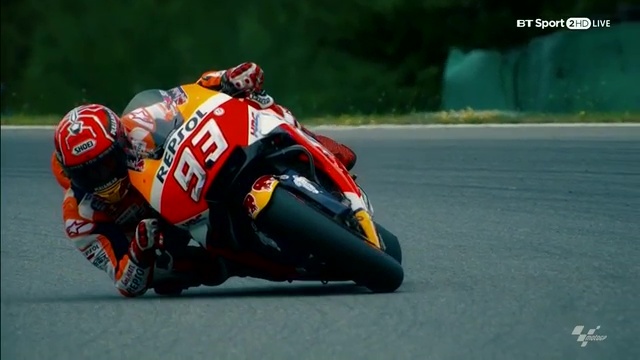 Marc Marquez (Repsol Honda Team) had two crashes on Friday – rider ok – but bounced back on Saturday to make history in signature style. 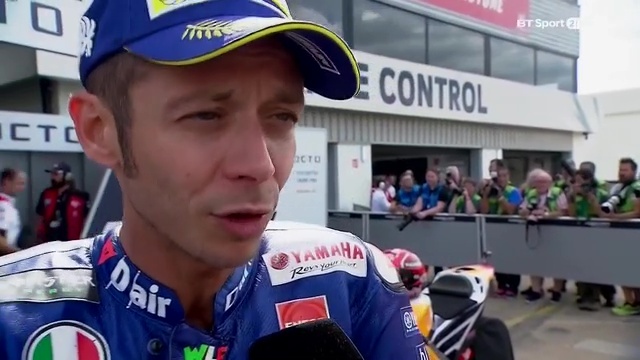 Putting in the first 1:59 lap of Silverstone, the reigning Champion was the only man to break that two minute barrier – but was less than a tenth clear of Valentino Rossi (Movistar Yamaha MotoGP). 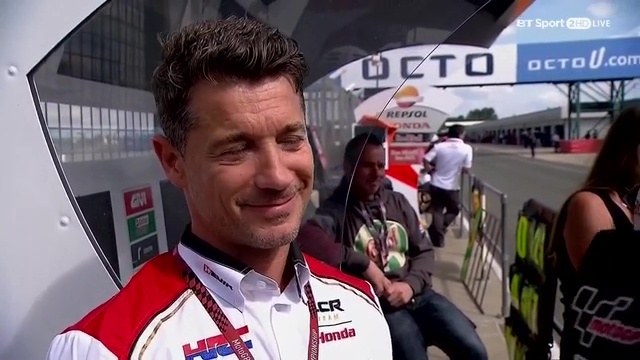 Feeling some ill affects from Friday’s misadventures and with some bad weather early on, Marquez didn’t expect the laptime to be possible, but did have a better feeling on the bike than on Friday – a good omen for the rider from Cervera to get in the fight for the win on Sunday. 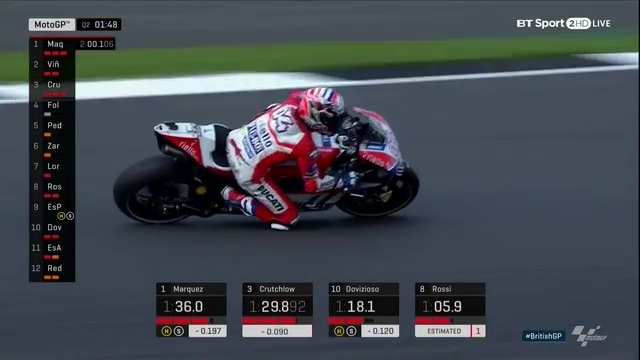 Satisfied with his laptime after proving the fastest Borgo Panigale machine all weekend, Jorge Lorenzo (Ducati Team) was nevertheless a little disappointed to be off the front row at Silverstone; riding with more confidence and getting closer and closer. 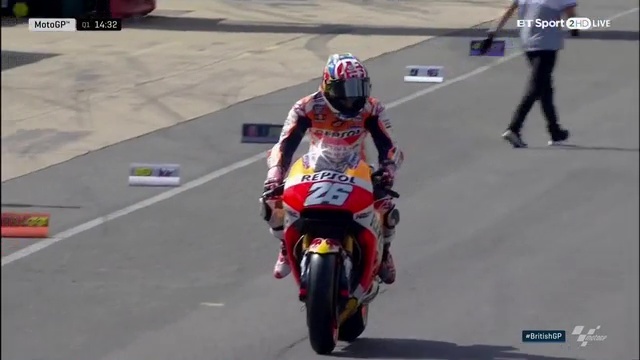 Fastest in FP4 on his second bike on a new tyre after a quick dash back to the pits, Lorenzo recovered momentum quickly after his first bike broke down – and carried that into Q2. 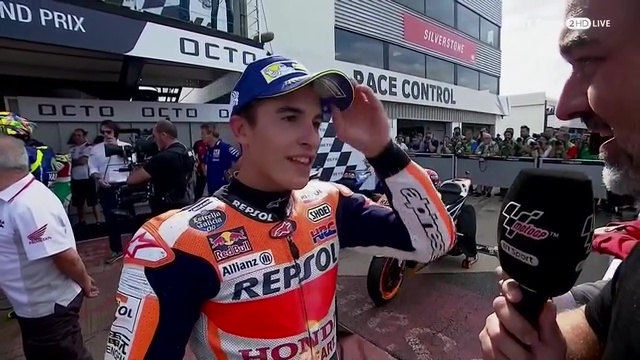 The most successful man in the premier class at Silverstone, the Spaniard says they’re getting towards being able to fight for something ‘important’ – and is riding with much more confidence. After FP3 saw little chance of improvement following early morning rain, Dani Pedrosa (Repsol Honda Team) and Jonas Folger (Monster Yamaha Tech 3) found themselves heading through to Q1 after a difficult Friday – and both moved through in the afternoon sun, with the Spaniard leading the German by a comfortable three tenth margin.